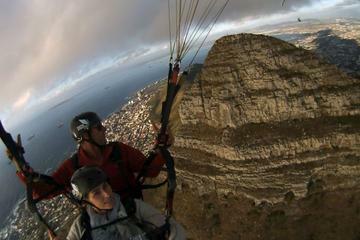 Soar above The Mother City like a Cape Black Eagle. For the best view of Cape Town, look no further than an exhilarating, but peaceful paragliding tour. Experience the best views of Table Mountain, Camps Bay, Robben Island, Lions Head, and a host of other coastal sites. Cape Town is one of the most beautiful cities in the world, with the magnificent table mountain cascading into the deep blue Atlantic Ocean. With so many naturally beautiful attractions and countless view-spots to admire each beauty, where does one start? That is simple, by jumping of signal hill, with a para-glider of course. Compare the prices and options Cape Town Has to offer. We have scoured the web and tried this one ourselves, you DONT want to miss it! The paragliding starts at signal hill. There you are paired with a guide/pilot, kitted up, and set on your way. You need no skill or know how, as your pilot will take care of everything. Then, from the moment you set off, the magic starts. As you feel the weight lifting off your feet your stomach will drop. However, a few seconds later, once you realize that you are flying rather than falling, that pit in your stomach is replace with a feeling of dreamlike awe. Gliding over the city, the cliffs of Table Mountain on your left, a fresh sea breeze coming in from the right, and the white sands of camps bay beach below. You will land at the coast, on a soft piece of grass. Again this takes no skill on your part, your pilot has you covered. Probably one of the best things I did in Cape Town. Simply Amazing!